Torsion springs are a type of helical metal spring that stores mechanical energy when twisted. Once twisted, the spring exerts proportional force to the amount that’s being applied, but in the opposite direction. This force twists the coils tighter, in turn reducing the spring diameter and making the body longer. Torsion springs can be designed in an array of sizes, materials, and thickness to suit any application. For electronics, miniature torsion springs are used, while larger variations can be used for industrial uses. Here are common applications that use torsion springs. Torsion springs are a vital component in all different types of doors, such as residential doors, garage doors and overhead doors used at loading docks and warehouses. They vary greatly in size and lift due to the wide range of door sizes and weights. These springs are widely used in door hinges as they allow the door to come back to its original position. If you have noticed doors in saloons that move back and forth when opened, but ultimately become stationary at their original position – this is due to springs used in their hinges. With a move to provide a greater number of seats in the same space new sporting and entertainment stadium seats are fitted with a mechanism to retract or lift up the seat when not in use. This provides the necessary space between the seating for evacuation and cleaning. Similar to those used for doors closures, Torsion springs provide the lift of the seat. These have been used for many years in cinemas where the lift was provided by weights in the seat itself. The advantage of the torsion spring is that smaller seats can be used and where necessary damping can be included to give a slow refined movement. Clipboards are a popular object that uses torsion springs. Similar to the motion of clothes pegs, clipboards clamp down to allow materials to be held in place. This powerful hold is due to the motion of the torsion spring pushing back as the material is placed underneath. In the medical industry, the torsion springs are used in a number of complex equipment. Different medical equipment that makes use of these springs include medical immobilisation devices, hospital beds, several dental applications, and wheelchair lifts. For additional strength, these springs are made from high carbon steel, which also helps increase the life span of the spring. This type of spring is normally close wound but can have a pitch to reduce friction between the coils. They offer resistance to twist or rotationally applied force. Depending on the application, torsion springs can be designed to work in a clockwise or counter-clockwise rotation, thus determining the direction of the wind. Torsion springs can also be configured to attach to components in different ways, including custom leg angles, lengths, and end styles. We have manufactured Torsion springs to wind backwards, where the force applied is in the opposite direction of the coil. This practice is not recommended as is can lead to distortion and premature failure. With the introduction of LED lighting, light fillings have become smaller and less obtrusive. For commercial applications, the lighting unit is fitted into ceiling tiles and to prevent them falling out as well as allowing access or replacement. The fittings are held in place by two torsion springs. These springs are usually double torsion but can also be single torsion with special legs to apply pressure on the back of ceiling tile. The torsion spring is ideal for this purpose as it allows the housing to be fitted with a wide range of ceiling tile thickness. Airedale Springs manufacture a wide range of these torsion springs for numerous lighting manufacturers. 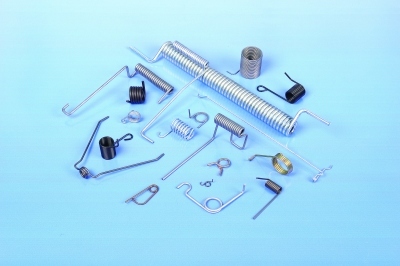 Here at Airedale Springs, we understand the importance springs have in many components. Over the years we have become an industry leader throughout the spring industry, supplying clients with many different products, from compression springs to extension springs. If you would like to know more about what we offer, get in touch with a member of our team who is happy to help.